I've written this blog post in my head for days (or let's say nights). I lay awake in my bed, coming up with a great string of words. But once I sit here and have to type, the words will just not flow. 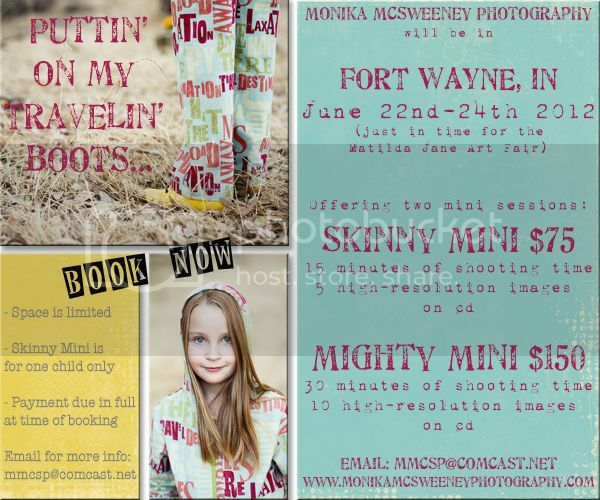 I could make it easy on myself and just say "Hey friends, I'm coming to Fort Wayne, IN for the Matilda Jane Art Fair this June!" But that would not cover all the emotions I've been feeling. I've been wanting to go to the Art Fair for the last three years, not so much for the shopping, but for the experience... finally meeting many of my online friends & the lovely peeps of MJC. But with our summer traveling schedule, it just never fit in ~ time and budget wise. Honestly, I had given up hope of ever going. Then, one of my Facebook followers asked a simple question "Any chance you will do mini sessions at art fair? ", my first reaction was "no way"! I could never go without my girls, they love MJC just as much as I do, it would break their hearts if I went alone. But my mind kept bringing the idea back again and again. So we had a family meeting to discuss the matter. My hubby said "Go for it! ", Grace said "But I have to be there to try things on!!" and Erina said "You'll never do it, you're too scared!" And that statement, it hit home... because it holds a lot of truth. I am scared to put myself out there. I'm scared to travel all alone. I'm scared to meet new people. If I had my girls with me, I would not have these irrational fears at all. I guess they are my constant companions, my safety blanket. It's goofy, I am aware of it! Are you coming to the Art Fair this year? Are you bringing your kids? If the answer is yes, well... then maybe... just maybe... you should book a mini session with me. You know how a picture can bring back a flood of memories? I'm hoping to bottle up lots of fun memories for you =), I'll do my best. I'll be shooting Friday & Saturday afternoon and maybe even Sunday morning. Exact location will be announced. I'm thinking downtown Fort Wayne (close to the hotels that most of us are staying at) for Friday, somewhere close to MJC on Saturday. Thank you for reading! I hope to meet you this June! Payment due at time of booking, session fee is not refundable. I would have never guessed that you were scared to meet new people! :-) YOU were such a natural when we met and hit it off great with my bean (she still talks about you)!!!!! Good for you and have fun, it always falls on my bean's birthday and my anniversary weekend, and somehow I don't think that sounds very romantic for Brent, LOL!!! Thanks, Tleshia... I guess I'm keeping it hidden well enough! Love that bean of yours, I can still hear her saying "Miss Monika, you are just so sweeeeet!" How FUN, Monika!!! I'm jealous!! !